A beaded bracelet made by seed beads and Swarovski Crystals. 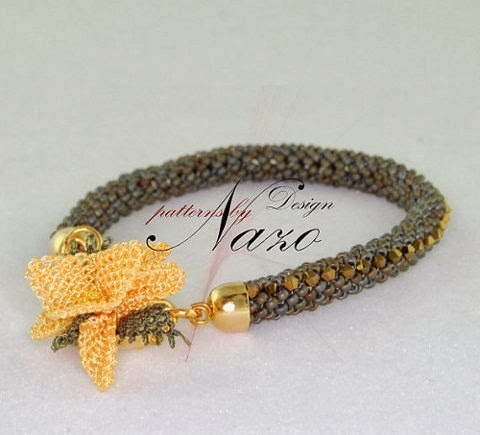 This bracelet is a unique, brand new design of Nazo Design®. A technique called Nazo Weaving II© is used to make this beautiful piece of art. The technique itself is developed by Nazo. * I offer the pattern, not the bracelet. * PDF file will include many photos and detailed explanations of each step. * The pattern is available in English and Turkish languages and will be only send as a PDF file. * Although all instructions and photos are copyrighted, and designed only for your personal use; please feel free to sell any product that you will produce by using these patterns. * I would be more than happy to see your finished products' photos. * Additional customer services are happily provided after your purchase with no additional cost. Please do not hesitate to contact me if you have any questions and/or concerns. Your happiness is my priority. Pattern is created by Nazo Design®. Photos are taken by Ugur Arpaci.